Welcome to our new president, Caleb Pinckney. Thank you to C.T. Bass for serving as president of the Ridgecreek HOA! Present were C.T. Bass (Outgoing President); Walter Joch (Vice President); Nancy Lochner (Treasurer); Diane Crook (Welcome); Phil Stabler (Landscape); Ray Ammarell (Architectural); Caleb Pinckney and NinaBrabham. Meeting convened approx. 7:00 PM at Nancy Lochner’s home. The Board extends their appreciation to Nancy for hosting the meeting, and to Board member Diane Crook for providing pizza and desserts for the enjoyment of all. C.T. Bass opened the meeting and brought up the first order of business, selection of a new President since C.T. is stepping down. C.T. nominated Caleb Pinckney of Staffwood Drive to serve as President. Caleb has lived in the neighborhood since early 2014, and had expressed an interest in Board participation at the Blocktoberfest event. Nancy Lochner seconded the motion, and the Board members present affirmed by unanimous vote. The Board extends its appreciation and gratitude to C.T. Bass for his service, and welcomes Caleb Pinckney to the position of President. Caleb presided over the remainder of the meeting and asked each Board member to report on their area. Architectural: Ray Ammarell reported that two requests had been received, one for a deck and gazebo from 20 Top Flight Ct. (approved); one for removal of two trees from 106 Staffwood Drive (pending contact with homeowner and site visit). Landscape: Phil Stabler reported that it was time for the current landscape firm to submit confirmed or updated pricing for 2015 (currently pay $641 per month). There was discussion about when/if the HOA should solicit competitive bids for the landscaping, and it was agreed that a list of firms would be made and bids obtained for 2016. Welcome: Diane Crook reported that the Welcome Committee is now caught up with delivering welcomebaskets for residents who moved in during 2014. The goal is to hand deliver a basket and copy of the covenants to new residents. The last one they delivered had to be left on the porch after several attempts. All agreed that Diane has done a great job with the welcome baskets. Treasurer: Nancy reported that the annual dues bills have been mailed, and that 30 residents have paid so far. Nancy reported approximately $19,400 in the savings reserve account, and approximately $8,500 in the checking account. Ray Ammarell reviewed the bank statements and initialed the account ledger sheets. 1. The neighborhood yard sale will be Saturday, May 16th. Phil Stabler has the sign. Ray will check with Karen about getting His House to pick up remaining items after the sale. Need to get a newsletter announcement to John Wertz by March 15th. 2. Caleb brought up several items for discussion:a. Asked if the drop box could be moved to a more visible location, as it is now hidden behind a bush. Ray indicated he would help with this.b. We should try to gather residents’ e-mail addresses by asking for them in the next newsletter.c. Caleb felt that there should be a deadline for payment of the annual dues, after which interest should accrue monthly at a 12% annual rate. Any costs incurred for collection Ridgecreek HOA Board Meeting MinutesFeb. 17, 2015would also be added to the amount due, and liens should be filed so the HOA could eventually recover the dues and the cost of collection. The annual invoice should be revised to include this information. 3. The next meeting was set for March 18th, 7:00 P.M. at Nancy Lochner’s house.The meeting adjourned about 8:15 P.M.
DFMS12 people in attendance: 7 board members: C.T. Bass, Pres. : Wally Joch, V.P. : Ray Ammarell, Architecture; Phil Stabler, Landscaping; Karen Ammarell, Newsletter; Diane Crook, Welcome; Nancy Lochner; Treasurer. 5 non-board members: Jim Vicar (previous Pres), Nina Brabham, Caleb Pinckney, Carroll Robinson, Ricky Crook. C.T. welcomed everyone and thanked all for coming. Opened discussion with his announcement/wish to resign president position - (more to be discussed on that later). Nancy Lochner – 2014 approved budget $17,000.00 2014 expenses $18,213.67 2015 budget to be same as 2014 ($17K) Checking acct. currently has $6,000.00 Contingency fund has $19,000.00-reserve for if/when HOA is sued. 2015 HOA notification of dues are ready to mail out – Nancy giving a few people a little time to get 2014 paid up. Board voted to keep HOA dues at $125.00. There are 4 HOA homes that are consistent in non payment and 7 that are 3+ years non payment. Nancy agreed to continue as treasurer unless someone was willing to take the position. Open to floor for discussion: Jim Vicar suggests that next treasurer be bonded due to handling of such a large sum of money. C.T. Bass recommends that HOA member be established in the neighborhood for “x”amount of time (“x” not defined). Also discussed that the HOA treasurer could be handed over to a private management company – there is a $175.00 month fee to handle annual dues, landscaping, architectural. A lawyer would bill separately (at some undetermined rate) for filing leans. This was tabled for later discussion as it is feared to be an extreme expense and would raise annual HOA. If HOA continues to have a lax community interest in serving a position on HOA – HOA board will be forced to move in this direction. Motion to accept the Treasurer’s report was made, seconded, and carried by vote. Phil Stabler – Landscaping One Palm Tree removed – needed to be replaced and was done free of charge. Possible additional landscaped areas to extend beautification of area – rip rap at stop sign to wooded area – all to wait until spring to re-visit. Sprinklers were shut off due to ice on roads in and around entrance. Phil willing to remain landscape unless someone wants position. Ray Ammarell – Architecture8 projects were approved 2014, 2 pools, 3 fences, one tree removal, one shrub bed and one shed.One fence approval was brought up that the new “taller” fence was installed and the shorter fence remains (is exterior to new fence). Future approvals will stipulate that “x” structure will be removed, when/if new structure is a replacement. Ray to follow up with owner to discuss the removal of shorter fence. Car parking on curb – both have been addressed by HOA. Blue car is not in HOA, red truck is HOA. New recycle trash cans seem to be an issue and are being left on side of homes, curbside etc – these follow same guidelines as trash containers and should be removed and out of sight by 7:00 p.m. the night of pickup. (this needs to be addressed in the newsletter). Diane Crook – Welcome Originally had 3 on committee – one has resigned due to work, 2 remain and are working hard to keep up with needs. Welcome committee has worked hard over the past 6-7 months to deliver 15 welcome baskets. Donations were provided by Beef O’Bradys, Pioneer Frozen Foods, Chic fil A, Restore Dental, Dutch Fork Animal Hospital, just to name a few. Welcome committee to deliver the covenants to renters as well. Idea to also possibly visit shut ins as well. Ridgecreek stadium cups distributed to the “4” non HOA members. Comments: Nancy Lochner asks that anyone aware of someone moving in to the neighborhood to please contact the HOA board – the only way we know of new neighbors moving in is IF the lawyer contacts the treasurer – we need a better system in place to learn of our new neighbors. Diane is willing to remain on Welcome committee. Wally Joch – VP Assists president when/where needed. Assists with Blocktoberfest and arranges annual meeting location.Comments: VP should move to President position – Wally not interested. Wally willing to remain as VP unless anyone else wants it.  Red recycle bins to be placed curbside on Saturday, Feb. 9 for DFHS to pick up to support recycle efforts at school. 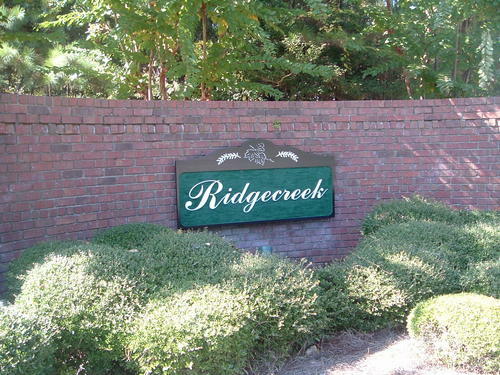 HOA will put a notice together and distribute to Ridgecreek in support of their needs.  Caleb Pinckney – new to Ridgecreek August 2014 wants to take an HOA position – discussions of treasurer/pres.  Recommend lead/committee position for organizing/coordinating the Blocktoberfest – with committee of new members or supported by HOA board. Please click here to see the complete Board of Directors for the Ridgecreek HOA. IMPORTANT: Do not leave valuables in your front seat or anywhere in your car where opportunistic criminals can see them. Remember to report anything strange or suspicious to 911. To post on this site mouse over Ridgecreek, on the top bar, then click on Forum. Anyone can post on the boards. If we get spamming or other outside clutter on our boards I will change the permission to invitation only. Older news on the Previous News page.